One thing I cannot get over is how much my cooking has changed in the last year. Meals used to revolve around the ubiquitous boneless skinless chicken breast. Mushrooms, eggplants and squash were only side dishes. Cheese was melted over everything. Up until a year ago I was cooking for a crowd, or at least more than two people. I used the crock pot and the pressure cooker; my freezer was packed full of whatever was on sale. Huge amounts of food were consumed. When my children were little, I loved nothing better than to make ‘kid food,’ but this never meant boxed man ‘n cheese! It meant homemade meatballs served with fun shaped pasta. Or Mickey Mouse shaped pancakes. Or individual pizzas, each made to everyone’s personal preferences. Toothpick night, dip night, eat dessert first night. Silly, I know….make a rice pilaf and stand some broccoli up like a little forest….then label it ‘enchanted’…… but I like it….and my kids used to love it….and that warms my heart….and besides, it tastes great. Kid food for grown-ups. Trim the broccoli making sure you have about 15 ‘trees’ that are long enough to stand up. Trim the tough spears. Plan to serve the remaining broccoli on the side. Steam the broccoli until just fork tender. Run under cold water to stop the cooking and to retain the bright green color. Sauté the onions over medium heat until softened and not brown. Add the garlic and cook for another minute. Add the lemon juice, seasonings, herbs, seeds, cheese and rice. Mix well and pour into a prepared 9 X 13 pan. Arrange the broccoli in a pleasing way throughout the rice. Drizzle with melted butter. Create a tent out of aluminum foil to partially cover the veggies. Bake 15-20 minutes in a 350 degree oven. Serve right away. Bake a potato. Add some of Isa Chandra’s Cashew Queso. Sprinkle generously with black beans, avocado and cilantro. Serve with pride. Drain the cashews and place the nuts in a high speed blender or food processor. Add the vegetable broth, miso, and cornstarch. Sauté the onion and peppers in olive oil until soft. Add the garlic and cook for another few minutes. Add the cooked veg to the blender. Add the seasonings and nutritional yeast to the blender. (save the lemon juice till the very end.) Blend on high until smooth and glossy. Pour into a sauce pan and heat and stir until thickened and bubbly – being careful not to scorch the bottom. At the last minute, stir in the lemon juice. This was super on the baked potato and also great on sandwiches and burritos all week. Perfect, perfect, perfect for dipping. Think ‘crock- pot- and-Super -Bowl- party- good’. 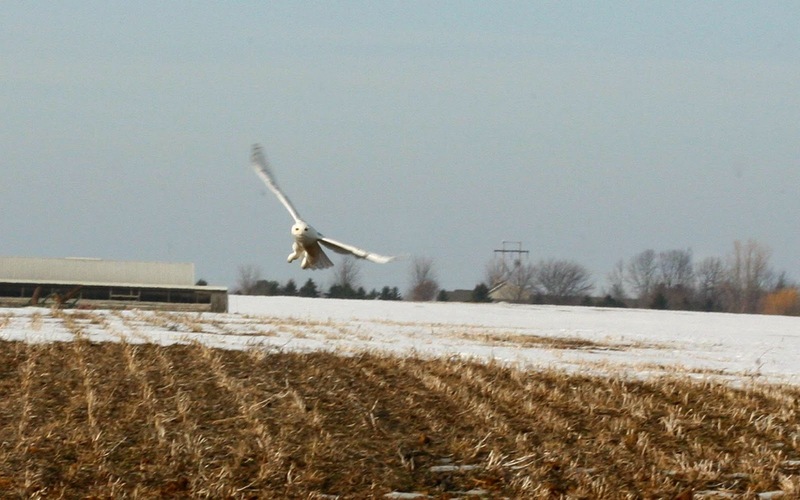 Well, I ended up actually seeing a Snowy Owl the other day – he was just sitting there, looking right down at me. No need to mention that I spent an hour searching for him, drove down every single muddy country road in the county and ended up half-way down some farmer’s driveway just so I could get this photo. Admit it – it was worth it! Isn’t he great? Mr. Living Cookbook (aka Tim) also spotted some of these gorgeous birds and his photos are spectacular – so I must share them also. I think spring might be just around the corner *FINALLY* here in West Michigan, so I bet the Snowy Owls will head up north soon. Warmer weather (that means in the 20s and 30s folks) means my taste buds crave salads. This one comes from Appetite for Reduction by Isa Chandra. She does all things well. The dressing is excellent and can be drizzled on all kinds of stuff. Arrange the salad on a large platter. Blend dressing ingredients until smooth in a high speed blender or food processor. Drizzle dressing liberally over veg. Note: Isa likes to smash the chick peas, but I prefer them whole. Isa likes to add capers, but I can’t stand them. Isa also likes more garlic, but I refrain from too much raw garlic. Get in the kitchen – but first go buy some mushrooms. This recipe is my creation, and it’s a keeper. I was in the mood for mushrooms and lasagna, and this is what I came up with. This recipe goes down in history - good for company but better for a Monday night at home with your family. 8 oz sliced shitake mushrooms – make sure no stems are hiding in the package- they’re tough and chewy. Cut them off and search the pile to be sure none are hiding. 16 oz sliced portabella mushrooms – gills removed – use a small spoon to scrape them away. 1 oz dried porcini mushrooms – soaked in 1 ½ C boiling water for one hour. KEEP that water! Clean all the mushrooms and chop the larger pieces in about ½ inch chunks. Cut the soggy porcinis in smaller pieces too. Sautee them all in a large pan in about 1 T olive oil. Be patient. It takes about 12-15 minutes to get them browned on most sides. Add another 1 T olive oil and drop in the minced garlic. Cook the garlic in the puddle of oil until it is fragrant – do not brown it! Even if you have to turn off the heat and let it just warm, that’s OK. Mix the garlic and mushrooms together. At the same time that the mushrooms are cooking, reduce the soaking water from the porcinis. I added ½ C of dry white wine, some salt and pepper and simmered the liquid for about 10 – 15 minutes. You want about ½ C liquid. When reduced, add 1 T Earth Balance butter and thicken it with about 1 t cornstarch. Instead of adding the cornstarch directly into the warm liquid, remove ¼ of liquid to a small bowl, sprinkle the cornstarch over it and whisk until totally dissolved. At this time, you can drizzle the slurry directly into the hot liquid – no lumps! Works like a charm every time. Heat until thick and glossy. The small amount of butter adds nice body and gloss. Pour the sauce over the mushrooms. At the same time that all this is going on, sauté some cherry tomatoes by heating them in ½ T of olive oil. When they seem ready to ‘burst’, prick them with a sharp knife to release some juice and pressure. Continue to sauté them until they are nicely wilted and deglaze the pan with some more wine. Remove from heat and set aside. You want it to be a bit juicy. At the same time this is all going on, boil the lasagna noodles according to the box. Assemble the lasagna as follows: spray an 8 or 9 inch square pan and place about 10 tomatoes in the bottom of the pan to keep the pasta from sticking. Create layers of pasta, mushrooms, cashew ricotta until everything is used up. Leave some pasta for the top layer and pour the remaining tomatoes over the top, tucking any stray corners of pasta down. I drizzled some more wine over the top to prevent dryness. Sprinkle with dried basil. Bake 350 degrees until heated through – about 30 minutes. I really wanna see one of these guys...I found this one on the internet. 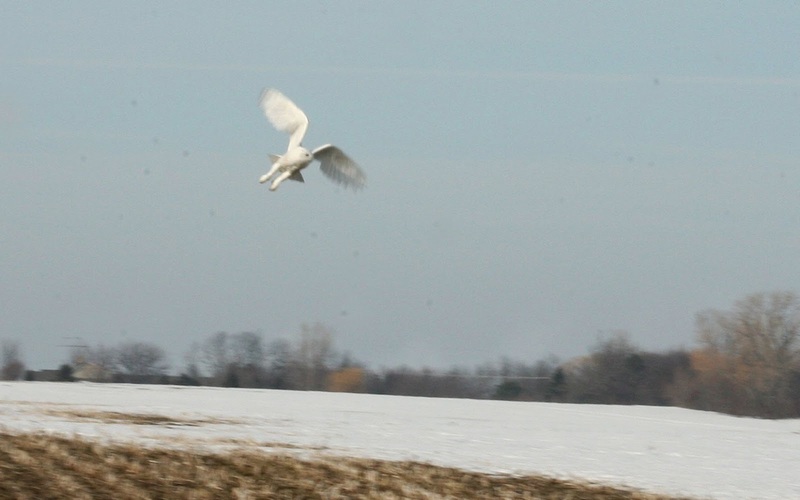 And speaking of time, today after church, Tim and I spent 2 hours driving around looking for Snowy Owls. TWO HOURS. 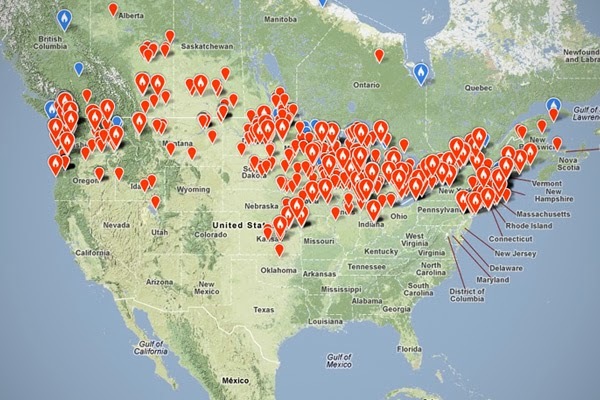 Now, before you write me off as crazy, please understand that the beautiful Snowy Owl has decided to make the northern United States his home this winter, and he’s usually an arctic bird, so it’s pretty special to see one way down here in Michigan. *ALL* my friends have seen them. 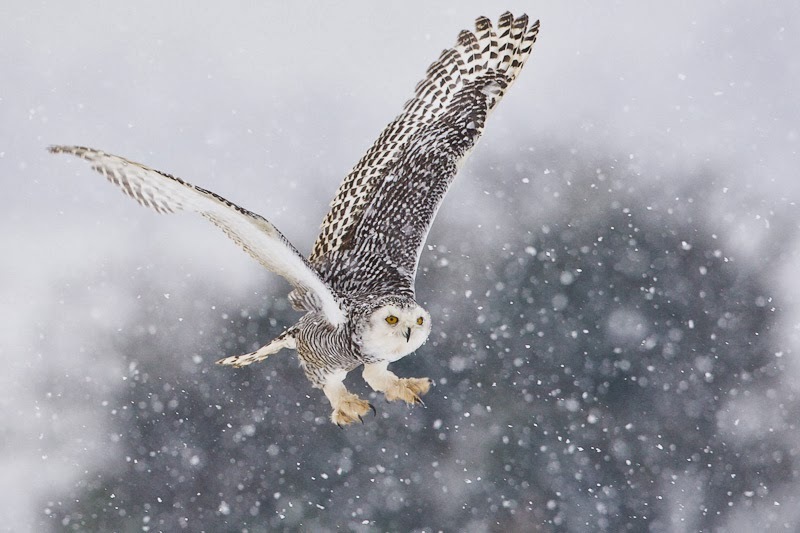 *EVERYONE* has a great photo on their phone of their favorite owl sighting. Supposedly you can see them *EVERYWHERE*….. So we decided to see for ourselves. ….. and of course…..we saw NONE. … Not one…. But we did see some pheasants. We had to settle for this plastic owl. I have made this excellent recipe twice, both to great acclaim. It was the perfect ending to my recent Valentine’s Day dinner party. I was going to serve something chocolate, but decided on the lemon, just so I could taste the lemon curd again. It’s AWESOME. I actually froze the cheesecake for a week or so before my party – no problems there. Just be sure to wrap it very well and thaw it slowly in the fridge. Don’t freeze the curd; make it just before serving and slather it on! The extra beauty of the lemon curd is that is covers over all the cracks in the cheesecake and makes a spectacular presentation. The recipe comes from Fine Cooking and can be found here. Don’t change a single thing. And speaking of Valentine’s Day and romance, here’s a light look at being married from church bulletin bloopers….